Protestors gather outside the CBIA's Church Street headquarters in Hartford. GE, along with Aetna, has threatened to leave Connecticut over the budget issue. 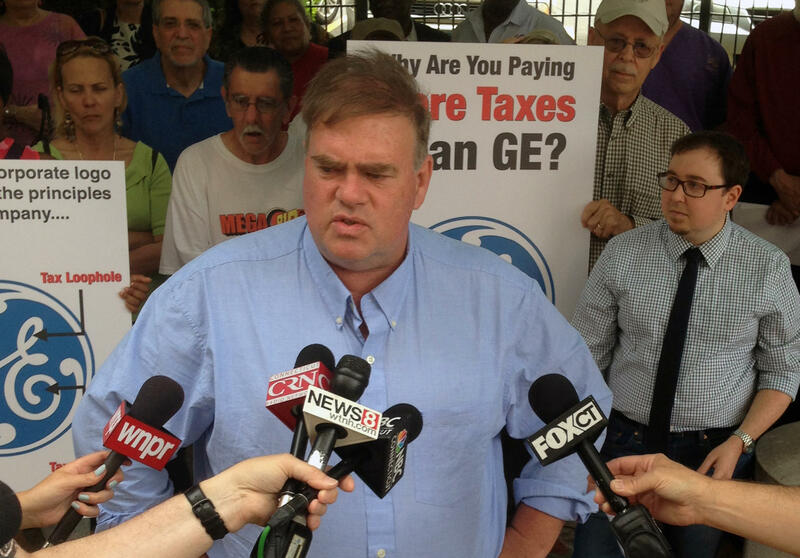 A coalition of activists and labor unions has written an open letter to General Electric, accusing the corporation of paying no taxes in the state of Connecticut, and commending the legislature for its attempt to increase business taxes in the recent budget bill. A small crowd rallied by the AFLCIO and the Connecticut Working Families Party gathered Thursday outside the Hartford offices of the Connecticut Business and Industry Association to protest the recent intervention in the state budget process by GE. Meanwhile, Tom Swan of the Connecticut Citizen Action Group accused the CBIA of dishonesty. He said the state has one of the lowest effective corporate tax rates in the nation, and that the legislature’s efforts to lower property taxes are far more relevant to the majority of businesses. Tom Swan of the Connecticut Citizen Action Group. "So in order to protect General Electric’s ability to hide their profits from the people of Connecticut CBIA is going to screw the rest of their members by continuing to keep property taxes high," Swan told the crowd. Not surprisingly, the state’s largest business organization sees it differently. CBIA’s Bonnie Stewart had an immediate response to the rally. "This is not simply an issue about the larger companies," Stewart told reporters, "because they have a significant supply chain that deals with thousands of small and mid-size business in Connecticut, whether you’re talking about the local pizza place, the machine shop on the corner. We all care about those businesses, because they are what make our economy work." GE, along with Aetna, has threatened to leave Connecticut over the budget issue. And other states are listening. Texas and Indiana are the latest states to reach out in a very public way to court Connecticut’s discontented corporations. The state of Indiana is suggesting three major Connecticut employers that openly criticized planned tax increases consider moving to the Hoosier State. General Electric has confirmed it’s formally considering a move out of Connecticut. This comes after the passage of a budget bill that hikes corporate taxes. The Connecticut Republican leadership recapped the 2015 legislative session at the State Capitol on Thursday. House Republican Leader Themis Klarides urged the governor to veto the budget if it wasn't the plan he wanted. Governor Dannel Malloy touted accomplishments related to property tax reform and investments in transportation during a press conference on Thursday at the State Capitol, while reporters questioned him repeatedly on his earlier promise not to raise taxes. Connecticut’s legislative session ended with a soft thud last week. There wasn’t quite the mad rush we're used to seeing as the clock ticked down. That means, lawmakers will have to return to the capitol for a special session. This hour on our weekly news roundtable The Wheelhouse, we recap the long session and talk taxes, as business groups and even other states are jumping in with comments on the state's new tax plans.